Dunlop ATV Tire Review - Best Buy Sport ATV Tires. When it comes to ATV sport tires, the Quadmax Dunlop ATV tire had more research and development devoted to it than any other ATV tire in history! The combined experience and expertise of two huge global companies - Dunlop and Suzuki - focused on building the ultimate ATV sport tire. It's usually a good idea to pay attention when you see that kind of effort focused on the development of a product. So how did they do? Pretty darn good. Rider reviews have been very good, and the price is right for a competitive radial sport tire. 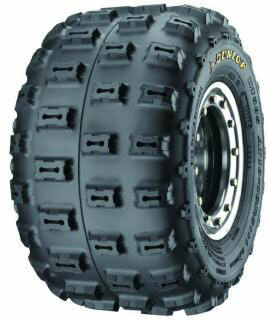 This ATV tire is also a winner in ATV racing at all levels. Suzuki chose it as standard equipment for their LTR 450 sport quad. Let's hit the high spots of the unique features of these ATV tires. Radial design uses two nylon carcass plies and two nylon tread belts for maximum stability and minimum tire growth and distortion. Radial front and rear construction allows all four tires to function together as one dynamic system for optimum handling. Front tire has a unique double-center rib design, which provides excellent traction in all types of cornering and camber situations. Rear tire has a feature not seen on any other ATV sport radial: an asymmetric tread design with optimized block-pattern for maximum side and forward traction. Dual-compound construction features one compound for the tread and another for the sidewalls, resulting in optimum flex for bump absorption, cornering, and traction. Tread pattern designed for optimum tread wear and tread-block stability. Low-profile rear tire maintains a uniform contact patch and allows the ATV to stay low to the ground for maximum cornering speed. One point we will add is that these tires are designed to work together as a "system". The tread patterns and tire profiles of the front and rear tires were developed over many hours of trial and error testing. We would suggest that you take advantage of that by running these quad tires as a matched set. Check out the video for some more background about this Dunlop tire. There may be ATV tires that are cheaper, work better on specific surfaces, last longer ..., blah ..blah ... blah. What you will not find is one single tire that does all these things better than this ATV tire. One thing I learned as a racer is to always take advantage of somebody else's development work when you have the chance. Well, here's your chance! You would be hard pressed to find an ATV tire with more development behind it than the Quadmax Sport. That adds up to a no brainer for us. Here's another no brainer - a custom link to the best Dunlop tire deals online.